A couple weeks ago I went to the Da Vinci exhibit at the Air and Space Museum in Balboa Park. You know, that guy was the defense contractor and DARPA of his time; much of what he conceived of was for defense or offense in battle. Lots of other things like flying machines and robots, too, but I never realized how much he was innovating for war. Our technology now keeps us alive so much more than in Da Vinci’s time. Then, it did so when one kingdom was attacking another, but daily subsistence was much closer to “hunter-gatherer” where they were close to the earth and how they got the stuff they needed. Now we seemingly live in a much more robust, sophisticated world, but our systems are fragile. A significant interruption to our massive supply chains would cause massive distress to a lot of people so used to our modern on-demand conveniences (BM 2013: the Cargo Cult theme). So we live upon a vast network of technology, and it being from us and through us so much, it is us. As our technology becomes ever more powerful and able to affect the lives of masses of people, and even who we are as individuals, tribes, and the whole of the human race, it is crucial to lead with our heart when developing it. We also have to talk more to people who are unlike ourselves, because our ability to do powerful things personally with technologies like gene editing will give us the ability to exert our will and wage battle in insidiously destructive ways, and have the same done to us. So we’d better start talking to our “enemies” more, those we have differences with, and find some common ground. Technology can connect or rend relations, can heal or can destroy. This is something I think has come from Pink Heart for me: listening to the heart and purpose for an engineered artifact more than to scientific and technical analysis, because none of us are truly fully rational, nor can we be. And we are fooling ourselves horribly if we think we can be. But we can be intuitive, and sensitive, and creatively solve many problems that speak to deep human hurt and need. This can give deep spiritual purpose to our technology. We need heart-centered design and engineering. Beyond exploring and driving for connecting technology to humanity, we could also think about redefining Da Vinci’s warrior ways in love warrior machines, connecting inventions. We plan events, share pics and Pink-Hearted hugs year-round in our Facebook Group. Join us! 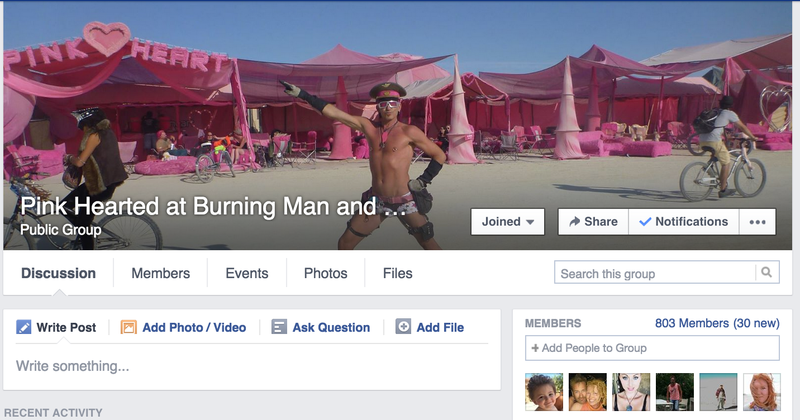 We have a new love-filled, snark free Burning Man group in Facebook where we are sharing Pink Heart memories, pics and more. People say, “jump the shark” like it is a bad thing. Sure, it signified a time in the story arch of Happy Days when things flew off the rails. But it paved the way for Mork, for God’s sake! And we are talking about FONZIE jumping over a shark. Is there anything more awesome (and Burning Man) than that!? Hell yes, Burning Man “Jumped The Shark” this year. Just like it does every year. In this 3 minute video I explain what Pink Heart does on Playa and how it is just one tiny way that we all have live-changing Shark Jump experiences of our own. Watch the full episode talking about how glorious the dust storms were, more about Pink Heart’s gifts, the surreal presence of Halcyon on Playa, and more. Song, “The 10 Principles Of Burning Man” – Graham Bolger Mix (with audio samples of me).